This presentation will focus on the industry landscape of social media marketing tools, and the industry drivers that are shaping product development. A brief look at the current state of social media marketing, including market drivers and business expectations in a challenging economy, followed by practical strategies for effective social media engagement for businesses at all stages of social media adoption. Many companies have reached a crossroads with social media. Should it be managed as just another PR channel? Or is it something completely different? How you respond will likely be the difference between success and failure. Live monthly webcasts for enterprise marketing professionals. 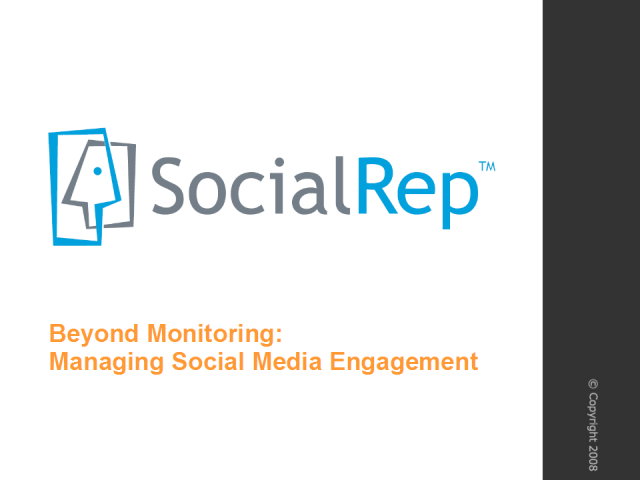 SocialRep offers insider insights into the challenges and opportunities of social media marketing, particularly for enterprise marketing professionals. Topics include social media marketing strategies, technologies, metrics and resources.